Interesting: Virus? Oops Not again!!! There are a lot of virus in the internet. Most of them come as a Keygen, crack, or through P2p. Some even act to be a codec application for some unknown video. Its better to install the some codec pack and let it take care of your codecs. The most common virus found in colleges are that files that appear like folder. It often deceives the most professionals into double clicking such files. the reason is that people opening folders fastly might consider that as a folder when its inside a empty folder. a lot of viruses have started to use this methodology. so u cant predict that its the same virus that u seen before... and it might not be detected by ur antivirus also. The next virus i like to say is a virus which changes the document files to exe files when u copy them. Recently my friend received such a virus in a mail under the title of call letter. unfortunately even i fell to this prank. thanks to bit defender v 10. The virus scans for any folder by name antivirus and deletes such folder. thats the reason nowadays antivirus applications dont name any folder with the text antivirus and often Norton is the first target for virus/trojan programmers. Some times whenever u try to scan ur system the antivirus comes and as soon as it starts, the program closes. to prevent such a happening, login to ur system using a limited account and launch the application as a administrator ie rightclick on the shortcut and select run as and enter ur admin username and password... that way u can execute the antivirus and make sure it scans ur system. the same can be done for taskmgr.exe . 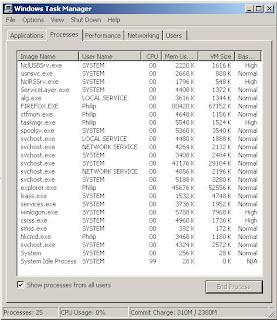 The picture of a task manager of a clean system is shown. The first 4 processes and the 6th might not be present in ur system.. The files such as winlogon.exe,lsass.exe, smss.exe,csrss.exe, alg.exe,spoolsv.exeare all important system files and they have only one instance in windows XP. The virus i hate most is that "folder" one. I Once had it in my sys, luckily i also had ZA at that time which quarantined it. Thats the most annoying one, it automatically closes explorer and windowed programs. But as far as i am concerned, if i find any trace of virus, I don't care about it until annoys me. And that time I will format the PC. :) As simple as that. i guess we all have shared similar virus experiences... apparently hitch hiked from college systems through the pen drives... the folder virus, the folder to exe virus... etc etc.. right clicking nd viewing the options , checking its size, a little less of unnecessary curiosity and common sense can go a long way in dealing with them...!! And hey, very recently i came to know that you can quarantine any dangerous virus by means of Nacl. and hey, remove this captcha, its annoying. Dont worry, no one would spam your blog.